Sometimes remote users or onsite technicians do not have reliable connections to the internal network and cannot access the credentials they need. Consistent access to passwords is critical, especially in emergency and DR situations when network connectivity is most likely to be compromised. Fear of losing access to passwords can slow adoption among teams and business users. Giving users a way to ensure their passwords are always available and quick to access can help drive usage of Secret Server. 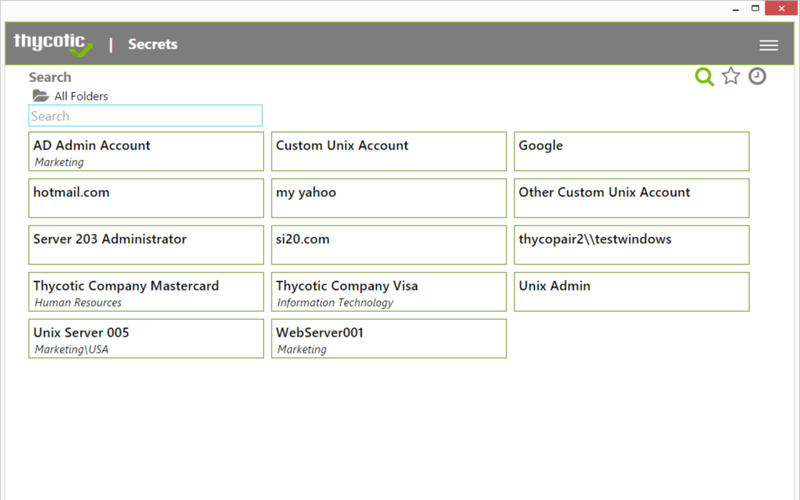 You can access your team’s Secret Server account from anywhere by using the Thycotic PAM desktop application. Search, browse, add, edit, view, or offline-cache Secrets. Thycotic PAM brings your Secret Server account to your desktop, whether you need to access a privileged account from a server room or at a client site. NOTE: This app requires an existing Secret Server installation. If you are interested in secure and convenient enterprise password management, request a trial of Secret Server installed. Installation is a matter of downloading the appropriate installer and running it. A detailed guide is available here.